Tape all appliance doors shut when moving. Wedge doors open in storage. Secure all moveable parts with paper or wedge. Wrap a paper mat around each item for protection. Freezers, refrigerators, washers and dryers make excellent packing cartons for bedding, towels and clothing. Always clean your stove before moving and give utility companies a few days notice to disconnect appliances. Clean then pack on hangers in wardrobe boxes. Books are very heavy! Pack them in small cartons, holding weight to under 30 pounds. Line all book cartons with plastic. Pack books flat so the spines aren't damaged and fill empty spaces with packing paper. Protect all chair legs by wrapping them in packing paper. Leave slipcovers on upholstered chairs and cover them with plastic covers. Take your time when packing dishes. Wrap each one with packing paper and cushion them in the carton with crumpled packing paper. 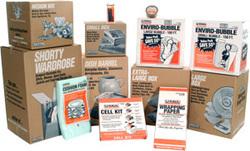 Keep dish pack cartons under 30 pounds for easy handling and safe riding. Pack lamp shades in individual boxes with plenty of paper for padding. Lamp bases ride securely in lamp cartons. For safety, pad them well with towels and blankets. Wrap your mirrors in paper mats, place in mirror pack and identify them with your marker pen so you won't accidentally bang or bump them. Plan to stand them on edge. Never store a mirror pack flat. Wrap paintings in paper mats and mirror packs. Mark them fragile and store them on edge, never flat. To prevent curling, place photographs between cardboard and tape together. If possible, remove legs to conserve space. Extra leaves should be tied together and padded.